Another great book by Kayla Stonor in the Qui Treaty Collection series. I recommend that you read the books prior to this one, so that you understand the relationship Jaden has with Sonil and everything he gave up in order to be earths tribute (even so according to the Qui he's not a very good one) as well as the dynamics between the other characters and the politic climate not only on earth but also in the Qui empire. I'm not into writing (or reading) reviews which basically tells you all the secrets of a book, so no spoilers here. I only like to tell you, that this one, well the whole series really, is sooo worth reading. Kayla Stonor's writing style will transport you into a world in which you love, laugh, suffer, cry and so much more right along with the guys she writes about. For me, this book is so far the best in the series, the story will captivate you and you are definitely in for a surprise, since the betrayal will not necessarily come from a person one would suspect. 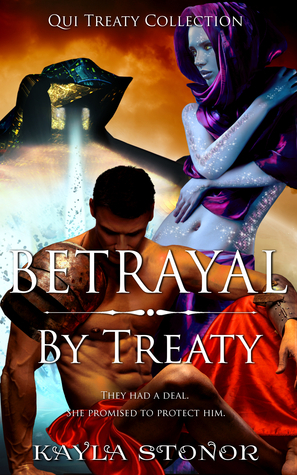 Sign into Goodreads to see if any of your friends have read Betrayal By Treaty.